If you’re like me, after taking some time off from writing, you’re refreshed and champing at the bit to translate all of those great ideas you had into compelling content. Unfortunately, your email inbox is apocalyptic. You’ve got clients, comments, and coworkers clogging up your notifications, and that new diet-slash-resolution is already close to DOA. But with the right mindset, tools, and a little help from your fellow scribes, you can get right back on track and go from blank page to first draft. Magical thinking won’t get words onto the page. In reality, the first draft of any piece of writing starts somewhere deep in the subconscious mind, when you’re sleeping or doing almost anything but staring at the blank page. It’s like the movie Inception, a dream within a dream, that slowly makes its way into your conscious mind as if by force of nature. Capturing it once it arises is critical, no matter how it’s wrested from your brain. Let’s be real here … it’s going to start as a mess. My colleague Stefanie Flaxman calls it the Necessary Mess, a means of harnessing whatever crazy ideas you may have and not judging or worrying about the state of those words when they’re caught. But research has shown that your brain puts an emphasis on notes taken by hand, and I’ve found carrying a small notebook with me at all times is a vital first step toward getting any first draft onto the page (more on my process later). The truth is, once you start a project in any format, you’re psychologically — even neurologically — compelled to finish it. I’ve written about the complex neuronal activities of your writing brain and how to avoid getting blocked, but the science of just getting started is one of the most incredibly powerful tools available. I also had the pleasure of interviewing writer and productivity wiz Bec Evans on The Writer Files podcast and she re-emphasized that serious writers adopt a small-steps mindset. “The thing about neuroscience is, not freaking out your amygdala with these big scary goals. B.J. Fogg at the Stanford behavior lab has fascinating research around tiny habits, and that you just start with the smallest, simplest thing and then you build up from there. Once you get into the mindset of “small is good,” you’ll get over comparing yourself to highly prolific writers every time you sit down. And remember, there is an intrinsic beauty to that barbaric rough draft. Pro sculptors don’t beat themselves up about an unformed block of clay, just like great painters don’t lament scant brushstrokes on a large canvas. Accepting imperfection, and even admiring it for what it is, is like the Japanese aesthetic of wabi-sabi. Every masterpiece starts with a hundred experimental iterations, and every famous author wants to go back and change the words they’ve published. She goes on to say that the second draft is for cleaning up those initial mistakes and the third is for tightening all the nuts and bolts. Every aspiring writer has probably read some form of this oft misattributed quote, many involving typewriters (so 1945). Variants of the quote have been credited to fiction author Paul Gallico, columnist Red Smith, Friedrich Nietzsche, Ernest Hemingway, Thomas Wolfe (the last two, years after their deaths), and a dozen other famous writers. The apocryphal nature of the quote obviously resonates with writers the world over. But what does it mean to write with blood? My theory is that it relates to the dedication and drive required to hammer out prose that speaks to an audience. The blood, sweat, and tears of getting to that third draft are all grist for the mill. I’ve interviewed more than 75 bestselling authors, both traditional and self-published, about how they keep the cursor moving week after week, year after year. All spoke to the fundamental truth that a commitment to the craft can be painful at times, both mentally and physically. And every serious writer finds the tools and processes that work best for them, out of necessity. I can’t think of a more dedicated group of content creators than my colleagues on the editorial team at Copyblogger, so I asked them to share their best advice for first drafts. 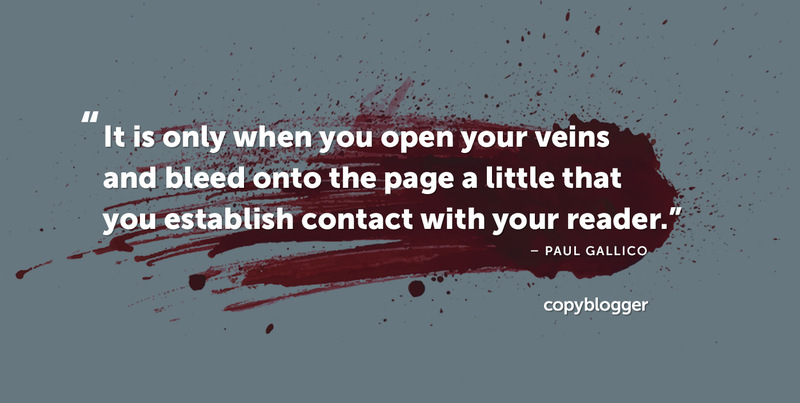 Coral-coiffed online educator, co-founder and Chief Content Officer of Copyblogger Media, Sonia Simone, shared a great piece of kindling for making that first cut. Stefanie Flaxman, Editor-in-Chief of Copyblogger, is a prolific writer and editor who manages the editorial team for Copyblogger.com. Loryn Cole, motorcycle blogger and Copyblogger’s Data Analyst, leans on the time-tested Pomodoro Technique and speaks to the wabi-sabi of early drafts. “Set a timer for 45–50 minutes — not to keep track of time but to give yourself space to focus. As long as the timer’s still going, you’re still writing. “Remember that writers have to make their own raw creative material. Your rough draft is your chunk of marble, your paint and canvas. It’s much easier to work from a bad first draft than nothing at all. “Do almost all on different days. I’m also a huge fan of the kanban board for organization (see also: Trello), and Claire recently wrote about how her personal kanban self-management system helped skyrocket her productivity. I often return to one of my favorite articles by Robert Bruce on the legendary copywriter Eugene Schwartz (author of the industry classic Breakthrough Advertising). “Schwartz describes sitting at his writing desk five days a week. It was a cluttered disaster, but he had a ritual and he never wrote anywhere else. “He’d have his coffee on the left … and a few pens on his right, displayed just so. “He’d turn to his machine and the ad he was working on (admittedly, he didn’t have to worry about Twitter back then). Robert goes on to note that Schwartz’s personal rules allowed him to do nothing but sit, drink coffee, look over his research and bare-bones outline, and write. Back in the days of the Internet Marketing for Smart People podcast, Robert got to interview another legendary copywriter, John Carlton. I’ve written about some very prolific and successful writers’ weird rituals for getting it done, but I’m not sure it has to be that hard. Again, with the proper mindset and tools, you should be ready to crack your knuckles and get to it. Before relying on conjury, superstition, or artificial intelligence to write that first draft, get back to basics. Once I’ve completed a suitable amount of reading, research, and thinking, I grab a notebook or note card and scribble a page of illegible notes. Then, I incubate them or bounce them off a coworker. That’s when I’ll grab the legal pad to sketch out a bare-bones outline and throw out as many headline ideas as I can. Once I’m ready to sit down, I start that timer (like so many of us), and I’m glued to my chair and the blank page, notes, and pens at hand. Sure I’ll squirm, drink coffee, and yawn, but eventually the words come. I’ll be completely honest with you … the piece I thought I was writing always takes on a mind of its own. But that first draft is a thing of perfect imperfection. “I don’t have an idea to write; I write to have an idea.” – probably the most inspiring words for a writer. As a writer & professional blogger, I love having a dependable routine to rely on. I always write at my desk, where I have notebooks, pens/pencils, highlighters, my paper files, and my computer. I have my writing routine written down where I can find it easily – first, brainstorming & research, then writing, then editing. All on different days, as you said. In my experience, feeling intimidated by a blank page is simply part of the process. Sometimes those moments really make me doubt my life choices but usually, they prompt me to simply put my head down and BEGIN. Thanks for a great article, Kelton Reid! It’s amazing how many of these strategies fall back on having the correct mindset and adequately preparing both your headspace and work space. Fantastic advice for a start up writer like myself. Just need to give the writing time the respect it deserves and approach it systematically.